The Washington Supreme Court threw a major wrench Thursday in plans for a big oil terminal on the coast, saying the proposal must be reviewed under a 1989 state law designed to protect marine life after the Exxon Valdez spill in Alaska. The Washington Supreme Court effectively canceled plans for a big oil terminal at the Port of Grays Harbor in a unanimous decision Thursday. 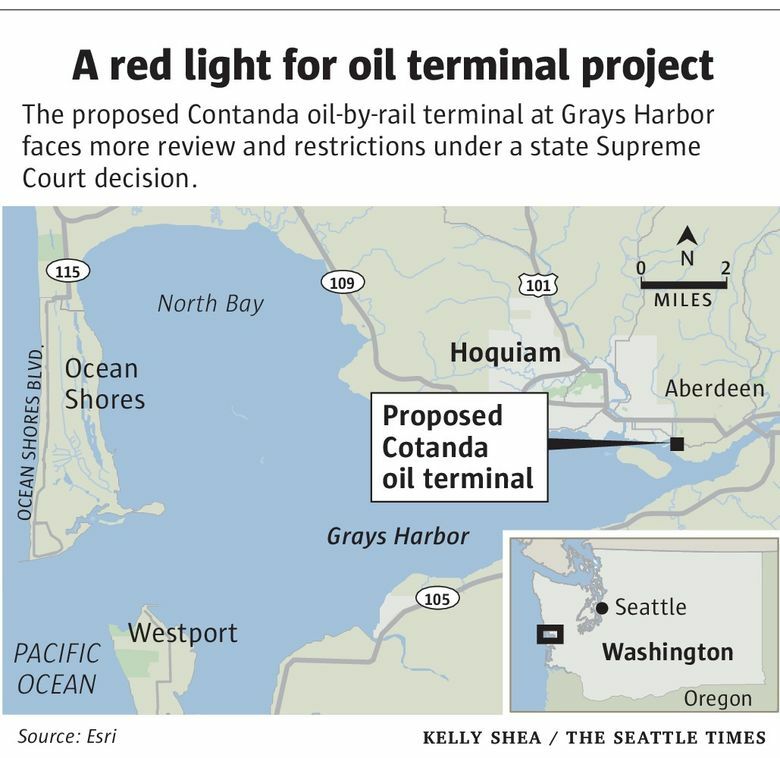 The justices reversed decisions by a state board and the state Court of Appeals, which held the Ocean Resources Management Act did not cover plans by Houston-based Contanda to ship crude out of the Port of Grays Harbor at Hoquiam, Grays Harbor County. The act, passed after the Exxon Valdez spill in Alaska, had not been tested in the context of a shore-side development proposal, and was originally passed to regulate offshore oil development. Kristen Boyles, an attorney with the environmental law Earthjustice, said the victory makes the project, up for a decision by the city of Hoquiam, almost certain to be denied. However, the project’s developer vowed to build the project. “No one knows what this means yet, except that it will be a lot harder to create jobs,” said Eric Johnson, executive director of the Public Ports Association, based in Olympia. He sees the possibility of two different approval regimes now, too, one on the coast, where the law applies, and another on the Columbia River, where it doesn’t. The Contanda project would receive up to 17.8 million barrels of oil a year, including from the Bakken region of North Dakota and Montana, for shipping to refineries in California and Puget Sound. Plans include the construction of four aboveground storage tanks that would each hold up to 8.4 million gallons, with a trainload of oil arriving every three days. In court, the developer argued — and the city of Hoquiam, state Department of Ecology and Court of Appeals agreed — that the Ocean Resources Management Act did not apply to the proposal because it was an expansion of an existing terminal and because the project would be located onshore, rather than in the water. Applying the law on a shore-side project is an “unfettered expansion,” the port association also argued in its amicus brief, complicating approval for any port project in which a product would cross over water while being loaded. The Supreme Court said that reading of the law was far too narrow. The ruling is the third in a string of recent wins by opponents of fossil-fuel transport projects. Washington’s outgoing public lands commissioner said this month he would not grant a lease for a major coal-export terminal along the Columbia River. This past May, the Army Corps of Engineers denied a permit for a major proposed deep-water coal port at Cherry Point, north of Bellingham, saying it would interfere with the Lummi Nation’s treaty-reserved fishing rights. A proposal to build the nation’s largest oil-by-rail marine terminal on the Columbia River in Vancouver, Wash., is yet to be decided. The Tesoro Savage Vancouver Energy terminal would handle about 360,000 barrels of crude oil a day — the largest such facility in North America.